Anglican ritualism, a movement that began in the middle of the nineteenth century, can be difficult to understand particularly for those who are not members of the Church of England. It it wasn't a single movement at all, but developed in a series of waves and by the second decade of the twentieth century it had polarised into different groups, each with a distinctive visual flavour. Around 1910 in reaction to what they considered to be the frumpy medievalism of the first phase of the movement, a new phase developed among younger clergy. Unlike the early phases which were scholarly and in tune with the prevailing Gothic Revival style and stressed their loyalty to the Church of England and its liturgical inheritance, the proponents of this new phase were much more reactionary, they were ultramontane ecclesiologically and liturgically and Baroque aesthetically. The leaders of this phase saw the provinces of Canterbury and York as separated parts of the Catholic Church and they looked for corporate reunion. The Malines conversations that took place between 1921 and 1927 between Lord Halifax and Cardinal Mercier, gave to these men the hope that such corporate reunion was but a hair’s breadth away – and that they should prepare for it liturgically. Those with this outlook used the rites of the Church of England's Book of Common Prayer in such a way as to make them appear as though they came directly from the Roman Missal. Vernacular translations of the Roman Missal The English Missal (first published 1912) and the Anglican Missal (first published 1921) were published that encased elements of the 1662 and the 1549 Books of Common Prayer into the text of the Missal. The ceremonial followed the rubrics from the Missal to the letter. They called this liturgical arrangement the 'Interim Rite', as they fully expected this to be a temporary expedient; corporate reunion was they believed going to happen and then Anglican clergy would begin to use the Roman Rite in it's fullness. As well as giving the liturgy an ultramontane air, they also prepared their church buildings for corporate reunion by attempting to make them appear as though the Reformation hadn’t actually happened. Rather than looking backwards to the Middle Ages as previous generations of ritualist clergy had done, they tried to affect what they considered to be a ‘resumption of arrested development’. What that meant in practical terms is that churches were to be re-furnished to appear as though they had organically developed as continental churches and had been affected by the aesthetic forces of the Baroque and Rococo. The clergy during worship wore cottas, lace-trimmed albs, Latin chasubles and birettas. As their aesthetic sensibilities reflected their theological position "Back to Baroque" became the rallying cry of this phase of the ritualist movement. In 1910 a 'fashionable set' of young ritualists, among them Ronald Knox (aged 22), Maurice Child (aged 26) and Samuel Gurney (aged 25), established the Society of St Peter and St Paul. Its primary purpose was to provide books, altar cards and vestments of an approved type for ultramontane parishes in the Church of England. Martin Travers (then aged 24) an erstwhile pupil of Sir Ninian Comper, was roped in to be the Society’s chief designer. The work they were doing was all very reactionary and great fun and the Society soon started churning out books and tracts, with illustrations by Martin Travers. 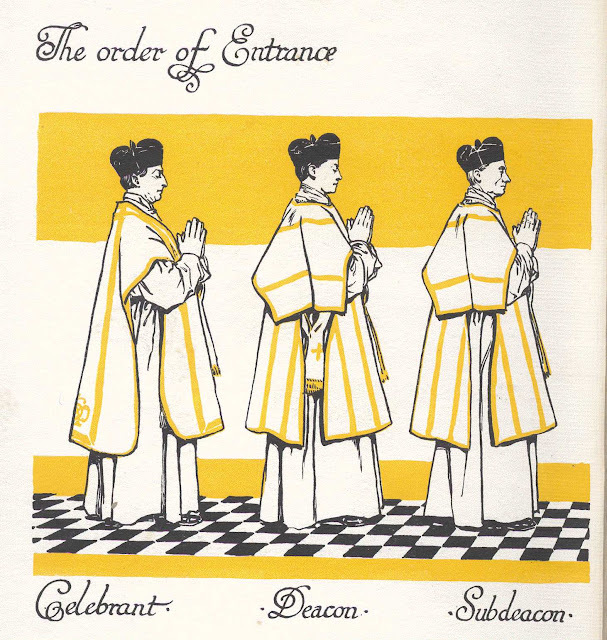 One of the early works produced for them by Travers was the beautifully illustrated Pictures of the English Liturgy published in 1916, a visual guide to the ceremonial of the 'interim rite' that showed a Low Mass being celebrated at a variety of Baroque altars by a priest in Latin vestments. 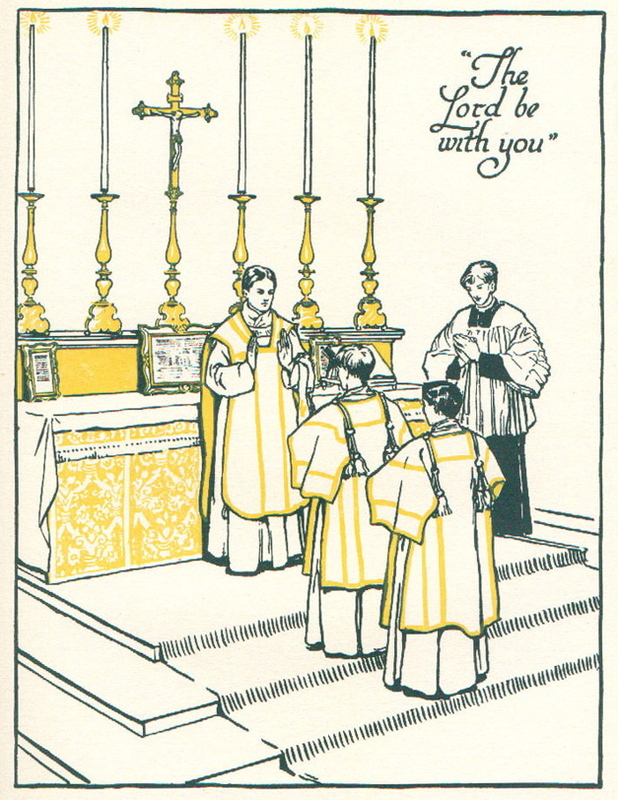 This was followed by a second volume for High Mass in 1922 and two illustrations from this are shown above, where you can see how they are printed in a striking black, white and yellow colourway. 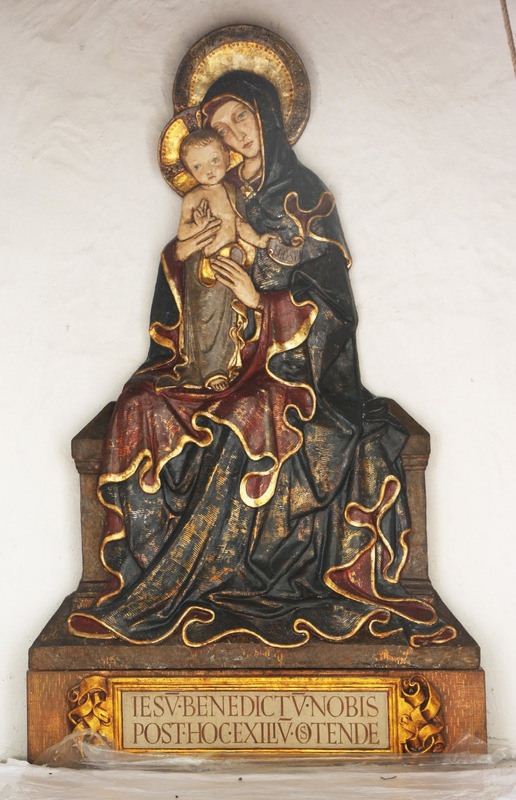 The Society also started advertising off-the-peg Baroque furnishings and with a puerile lack of taste, they even marketed in the church press a 'Latimer and Ridley votive stand' named after two of the Protestant bishops burned at the stake in the reign of Queen Mary. Latimer's last words to Ridley as the flames were lapping around them were: "Be of good comfort, Mr. Ridley, and play the man! We shall this day light such a candle by God's grace, in England, as I trust never shall be put out." Eventually these men grew out of their youthful frivolity and settled down, Ronald Knox became a Catholic and a Monsignor, Maurice Child became a well-respected Anglican parish priest and Samuel Gurney a respected lay member of the Anglo-Catholic movement. Their ultramontane principles and their love of the Baroque never left them. 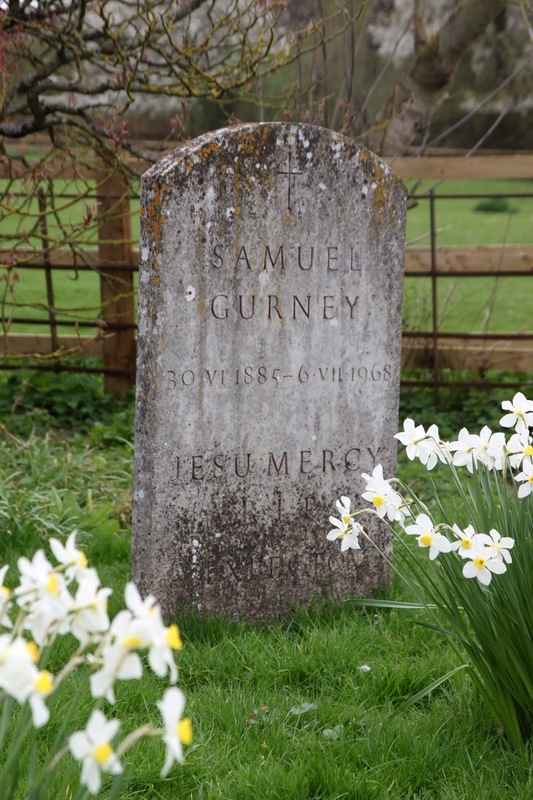 In 1925 Samuel Gurney settled down and he purchased a Victorian Gothic Rectory in the remote hamlet in Compton Beauchamp in Berkshire on the edge of the Vale of the White Horse. 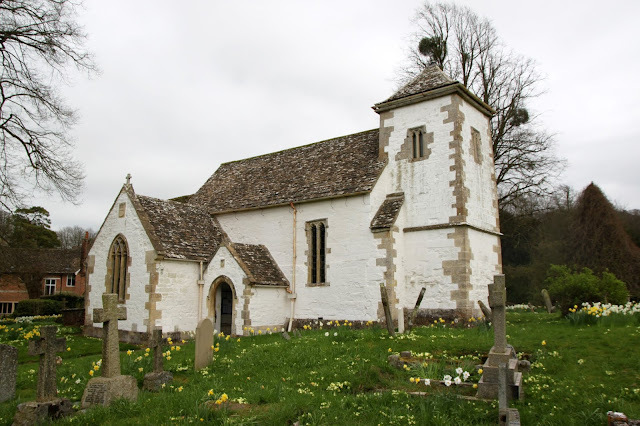 Beside it was a tiny whitewashed medieval church and with Travers help he restored and refurnished the church. Over the course of the next twenty five years, Gurney would transform the church into a model of ‘Back to Baroque’ aesthetics. Thankfully his work still survives and is a superb example of the genre. 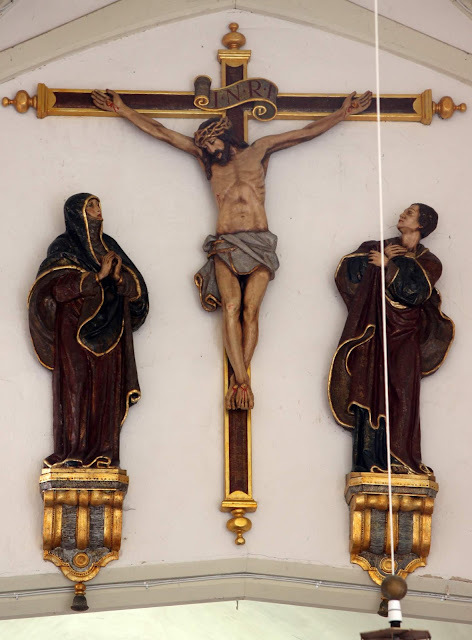 The work began with the installation in 1927 of a striking rood group placed above the chancel arch. 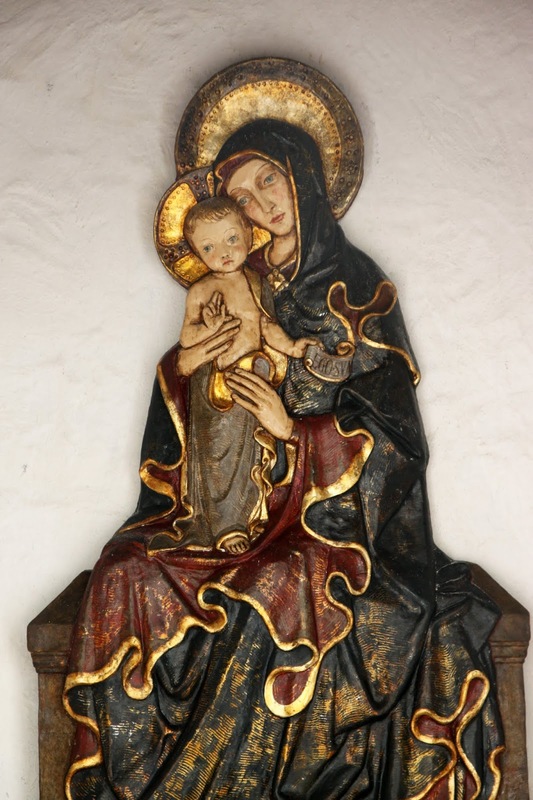 Executed in moulded papier-mâché, the figures of Mary and John supported on classical brackets and painted in dark tones of dark purple and black which contrast with the whitewashed walls of the church. 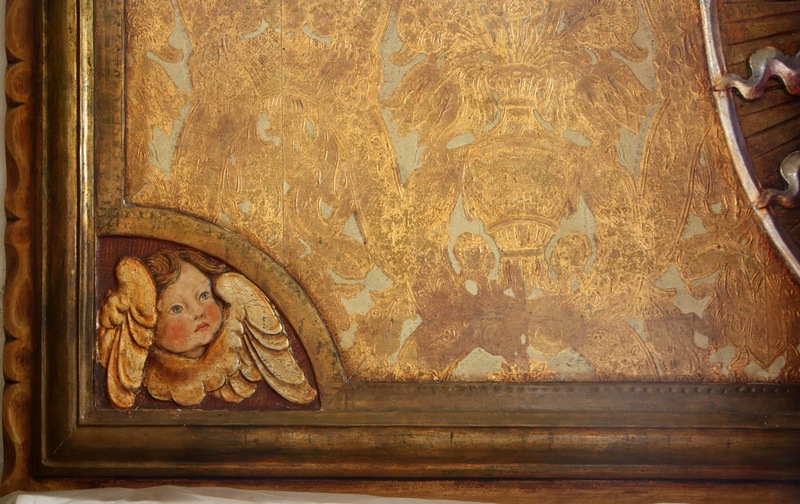 Travers has chosen a different approach to gilding than his master Comper, than than burnished splendour the the gilding here has been darkened and toned to remove it's brash lustre and to give the appearance that the rood had always been here. 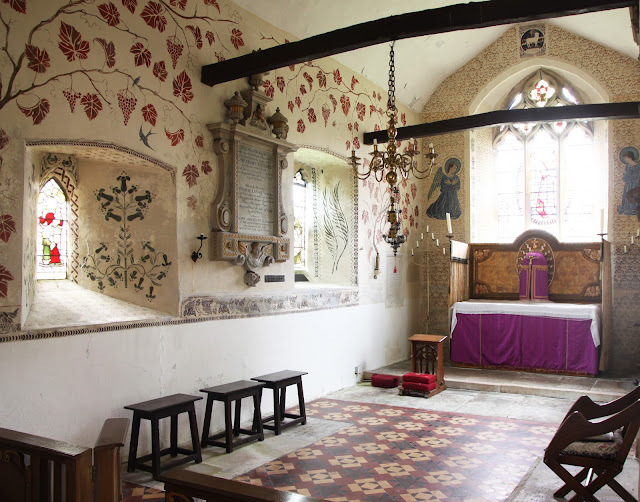 The chancel of the church had already been painted in the nineteenth century with a rather lovely vine trail and Travers added to that. He installed a new high altar in 1927, with riddel brackets terminating in little sconces and curtains that enclose the altar it's a Baroque spin on what Comper called an 'English altar'. Travers was adept at using inexpensive materials to give a superficially rich visual affect. The reredos of the altar made by pasting Sanderson embossed wallpaper onto board and gilding some parts with Dutch metal (artificial gold leaf) and the fixing the leaf a with yellow shellac varnish mixed with burnt umber to give a toned down look. The central Mandorla and putti are made of papier-mâché. From a distance the whole looks like an elaborately and expensively carved and gilt altarpiece and again the impression created is of furnishings that have always been there. Travers had some fun with the high altar tabernacle. It's a large domed tabernacle and it's rather out of scale, leaving little space for the priest to celebrate mass and no space for an altar cross. Travers novel solution to the problem was to mount the altar cross on the front of the tabernacle. The most playful bit of the work is probably the altar of Our Lady. The church is small and there is little space for additional altars. In this Travers placed an altar in the space directly under the west tower. Two doors swing open to reveal the altar and a relief panel of the Virgin and Child above it, made of painted and gilded papier-mâché. The font cover followed in 1934, a memorial to Lady Talbot de Malahide, Gurney's mother. It is based on East Anglican font covers of the seventeenth century, notably that (since lost) in Little Walsingham, where Gurney's brother was Lord of the Manor. 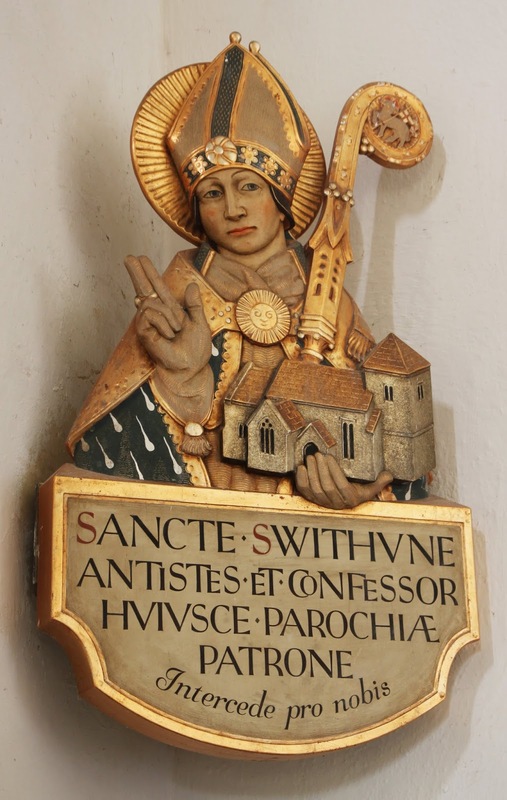 Then in 1937 the wall plaque above with an image of St Swithun was introduced. This time carved, but in Traver's usual low relief style. Mounted in the angle between the east and south walls of the nave, there is not evidence that the relief was a focus of devotion. Work stopped entirely during the Second World War, but continue afterwards. Parclose screens were introduced in 1947 to divide the transepts from the nave and the last work was the introduction of altar rails in 1957. 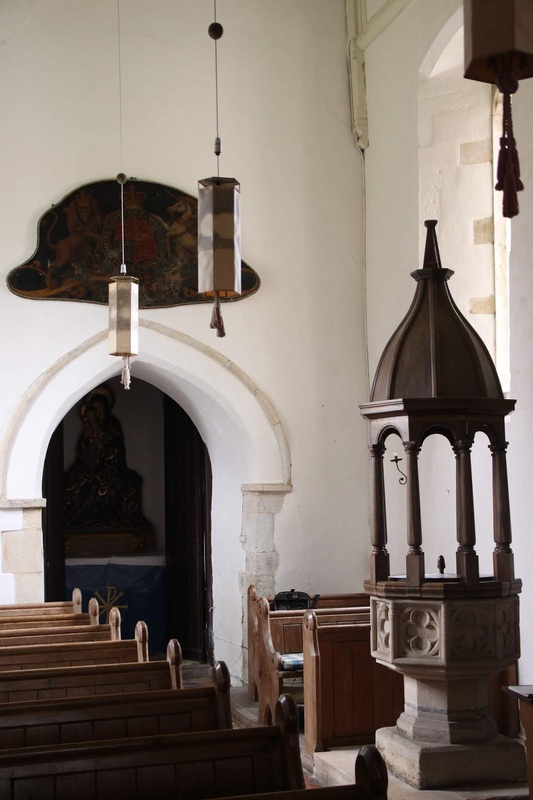 There is no doubt that Travers and Gurney’s pastiche at Compton Beauchamp is exquisite. Ten years ago the place was looking very sorry for itself, the papier-mâché had got damp and was growing a covering of white mould - it somehow added to the sense of artifice. The rood in 2006 with a white bloom of mould. It has since been restored, which is certainly for the best, but you can't help feeling it has lost something in the process. Compton Beauchamp was always a bit of a folly really - it was never used with any regularity for the 'interim' rites that Gurney and Travers intended and it was the Book of Common Prayer, without interpolations and additions, that appears to have been in use here. The Prayer Books and Hymnals still remain in the church, each stamped with a gilt design by Martin Travers. 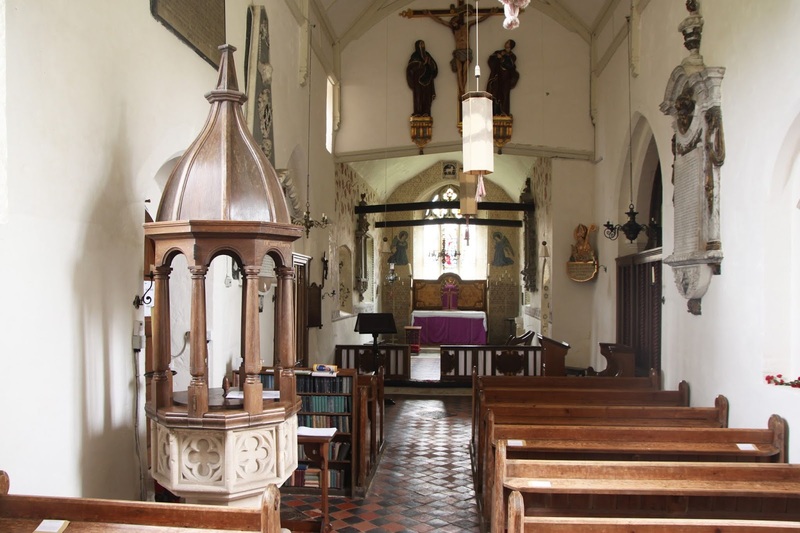 By the time the work was finished at Compton Beauchamp in the mid 1950s Gurney was by then an old man - the ecclesiology and aesthetic of his generation was by then unfashionable and the Catholic Church was on the cusp of extraordinary change. The Baroque Ultramontanism that Gurney and his friends loved so much, was to have the wind taken out of its sails by the force of the Liturgical Movement. The possibility of corporate reunion, on which so much of the movement's ecclesiology and liturgical ethos was predicated, turned out to be a fantasy too and was swept away by a new brand of Ecumenism. 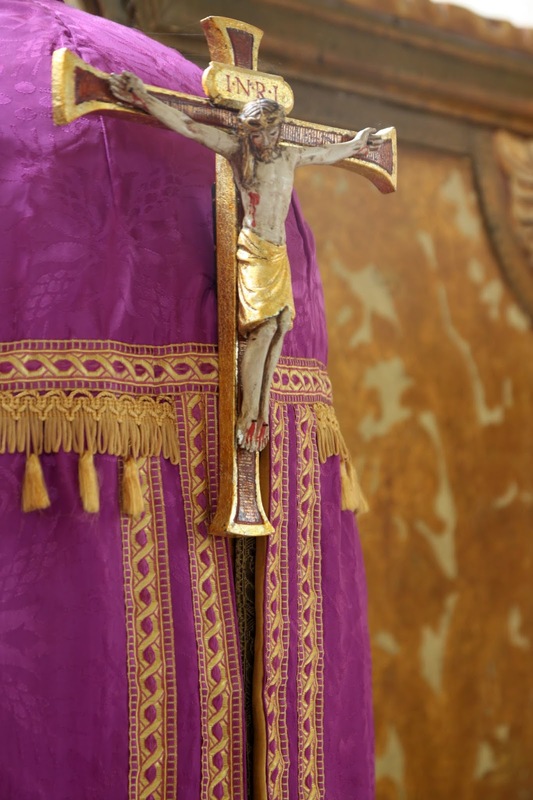 In 1970s the younger Anglo-Catholic clergy moved from using the English Missal to the Missal of Paul VI and were slinging out Latin vestments in favour of polyester Gothic vestments, just as quickly as their Catholic brethren. Compton Beauchamp and churches like it are appreciated once again and now stand as a beautiful symbol of one generation's hopes and dreams. They had great fun imagining a different future where the Church of England entered full communion with the Holy See, but they were a set of dreams that were probably unrealistic and for the moment remain unfulfilled. Samuel Gurney 1885-1968, buried among the daffodils in Compton Beauchamp churchyard.